By using this Site, you agree to be bound by, and to comply with, these terms and conditions ("Terms and Conditions"). You also agree to comply with any guidelines or rules posted on the Site regarding any product or service offered on the Site. All such guidelines and rules posted are hereby incorporated by reference into these Terms and Conditions. Please read them carefully. If you are dissatisfied with the Site, its content or its Terms or Conditions, you agree that your sole and exclusive remedy is to discontinue using this Site. PLEASE NOTE: We reserve the right, at our sole discretion, to change, modify or otherwise alter these Terms and Conditions at any time. Unless otherwise indicated, amendments will become effective immediately. Please review these Terms and Conditions periodically. Your continued use of the Site following the posting of changes and/or modifications will constitute your acceptance of the revised Terms and Conditions. For your information, this page was last updated as of the date at the top of these Terms and Conditions. When you visit PLC, purchase products or services through the Site, submit your contact details through the PLC shopping cart, use one of the PLC online contact forms or email the Company, you are communicating with us electronically. You consent to receiving communications from us electronically. We will communicate with you via email or by posting notices on and updates to the Site. By using the Site, you hereby agree that all agreements, notices, disclosures and other communications that we provide to you electronically satisfy any legal requirement that such communications be in writing. We welcome your feedback about the Site. However, any comments, ideas, notes, messages, suggestions or other communications sent to the Site shall be and remain the exclusive property of the Company, and we may use all such communications in any manner, including reproducing, disclosing and publishing such communications, all without compensation to you. PLC does not intend the Site to be used by individuals under the age of thirteen (13) ("Child" or collectively "Children") without the supervision of a parent or guardian 18 years of age or older (a "Guardian"). PLC relies upon Guardians to determine if any content or items available on the Site is inappropriate for the viewing, access or purchase by such Children. If a User is a Child, he/she may use the Site only under the supervision of a Guardian. If you are making a purchase on behalf of a business or third party through the Site you must have the authority to bind them to these Site Terms and Conditions. By entering any information on this Site, you represent and warrant that you: (i) are at least 13 years of age and if under 18 years of age are using the Site under the supervision of a Guardian; (ii) are using your actual identity; (iii) have provided only true, accurate, current and complete information; (iv) provided an accurate billing and shipping address, and an accurate phone number and email address, and that the billing address and phone number is the same as the address and phone number that your credit card or bank has on file for you; (v) will maintain and promptly update the information that you provide to keep it true, accurate, current and complete; and (vi) are not using the Site for any improper or illegal purpose. If you provide any information that is untrue, inaccurate, not current or incomplete, or if we have reasonable grounds to suspect that such information is untrue, inaccurate, not current or incomplete, we may suspend or terminate your account and refuse any and all current and future use of the Site. For orders that have already been shipped, you can confirm the date and method of shipment and an estimated date of arrival, by calling our Customer Service team at (800) 986-3816. As long as your order or merchandise from the Company has not yet entered the shipping and handling process, you can change the details of your order by calling Customer Service. PLC will not provide reimbursement for shipping and handling charges for cancelled orders once the order has entered the shipping process. You agree that your placement of any order and/or participation in any programs offered by the Company on the Site is sufficient to satisfy the Statute of Frauds, and no further writing is required. Terms of payment are within the Company's sole discretion, and unless otherwise agreed in writing, payment must be received by PLC prior to acceptance of an order and/or participation in a program. PLC may accept payment via Visa, MasterCard, and American Express (other credit or debit cards and payment methods may be added or removed at the Company's sole discretion). Orders are not binding until the order and/or participation in a program is accepted by PLC and PLC may cancel or limit an order any time after it has been placed for any reason in its sole discretion. The Company expressly conditions its acceptance of your order and/or participation in a program on your agreement to these Terms and Conditions and the terms of the program, as applicable. Unless otherwise noted, PLC will make best efforts to ship in-stock merchandise within 7 to 10 days of the receipt of a properly completed order, but this is only an estimate. You understand that product availability may be limited and particular products may not be available for immediate delivery, even if the product is not identified as "out of stock" on the Site. If a product is identified as "available", this means that to the best of our knowledge, we can supply the product. However, this does not mean that the product is necessarily in stock and available for immediate shipment. PLC shall not be liable for any loss, damage, cost or expense related to any delay in shipment or delivery. The Company may opt to transfer title to any product and risk of loss passes from the Company to you upon shipment from the Company's facility. We advise that all customers carefully check which replacement lamps they need, including checking all appropriate projector/TV and lamp part codes before ordering to reduce the chances of needing to return the product. We recognize that it is sometimes necessary to return a product and we will take appropriate measures to make this process as smooth as possible for our customers. Please note that we do not accept returns of projector lamps which are being returned as a result of a faulty projector or TV, whether the lamp itself is faulty or not. 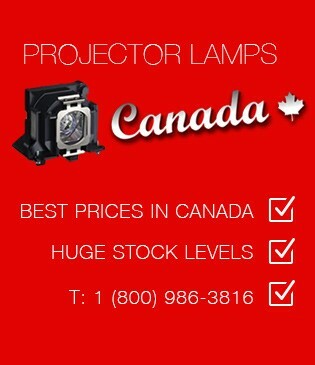 Problems with the projector’s ballast and/or other internal parts can irreparably damage a projector lamp without the lamp even lighting up and so we unfortunately cannot accept returns of these products. Also, PLC will void the warranty if the lamp has been modified or altered in any form or shape (this includes removing the bulb from the housing or altering connectors). If you need to return any product(s) purchased from PLC you must first obtain a Return Merchandise Authorization (RMA) number by contacting our Returns Department by email at returns@projectorlampscanada.ca or by telephone at (800) 986-3816. ALL lamps shipped back to PLC must be returned in their original, undamaged boxes, without any pen marks or shipping labels on the lamp packaging, and must be shipped inside an additional box with appropriate packing material (such as bubble wrap) to prevent damage during shipment. If the lamp has been opened, we reserve the right to charge a 30% restocking fee which takes into account the fact that an opened item will not be re-sold. Please do not mark the packing of the product in any way. If the box is written on, or marked in any way, the returned product will be refused. Shipping costs will apply to returned items. All accessories in their original wrapping/packing material must be included with the returned lamp including all manuals, warranty/guarantee information, and instructions. The Customer will pay shipping costs on returned items and must insure the package for the purchase value. Acceptable shipping carriers are UPS, Fed-Ex, Purolator and DHL. We are not responsible for any loss or damage during shipping of returned items. All product returns must first be authorized by PLC within 100 days of the original invoice date and a RMA number must be obtained before shipping the lamp back to us. Items returned without a RMA number will be refused upon delivery. No returns will be accepted on Special Order Lamps. Any lamp priced above $600.00 is considered a Special Order Lamp. Please note: Some manufactures handle defective lamps themselves, if this is the case, we will work with you to help you quickly resolve the issue directly with the manufacturer. In addition to our returns policy listed above, we at PLC also warrant solely to the original customer purchasing products directly from PLC that all such sold will be free from defects in materials and workmanship affecting form, fit and function ("Manufacturer Defects") for 120 days from the original date of shipment. We have limited any claims under this limited warranty to the customer who purchased such products from the Site and only during any initial period that customer owns such products. Any claim with respect to such products where the original customer seeks a refund of the purchase price of such products must be made within 120 days from the original date of shipment of such products by PLC. The limited warranty provided herein covers only manufacturer defects and does not include malfunctions or failures resulting from misuse, abuse, neglect, alteration, problems with electrical power, projector damage, usage not in accordance with product instructions, acts of nature or improper installation or repairs made by anyone other than PLC. Such limited warranty only extends to refunds or replacements of PLC products and does not cover any damage to your projector, television or other devices arising from your use of our products. THE SERVICE IS INTENDED FOR CANADIAN AND U.S. RESIDENTS ONLY. THE SERVICE IS PROVIDED ON AN "AS IS" AND "AS AVAILABLE" BASIS AND WITHOUT WARRANTIES OF ANY KIND EITHER EXPRESS OR IMPLIED. TO THE MAXIMUM EXTENT PERMISSIBLE UNDER LAW, PLC DISCLAIMS ALL REPRESENTATIONS, WARRANTIES AND CONDITIONS, EXPRESS OR IMPLIED, INCLUDING BUT NOT LIMITED TO IMPLIED WARRANTIES AND CONDITIONS OF MERCHANTABILITY, MERCHANTABLE QUALITY AND FITNESS FOR A PARTICULAR PURPOSE, TITLE, NON INFRINGEMENT OF PROPRIETARY RIGHTS, AND IMPLIED WARRANTIES AND CONDITIONS ARISING FROM THE COURSE OF DEALING OR COURSE OF PERFORMANCE. PLC DOES NOT WARRANT THAT THE SERVICE WILL BE UNINTERRUPTED OR ERROR FREE, THAT DEFECTS WILL BE CORRECTED, OR THAT THE SITE OR THE SERVER THAT MAKES IT AVAILABLE WILL BE FREE OF VIRUSES OR OTHER HARMFUL COMPONENTS. PLC DOES NOT WARRANT THE ACCURACY, COMPLETENESS OR CORRECTNESS, TIMELINESS, OR USEFULNESS OF ANY OPINIONS, ADVICE, SERVICES, MERCHANDISE OR OTHER INFORMATION PROVIDED THROUGH THE SERVICE OR THE INTERNET GENERALLY. IN NO EVENT WILL PLC BE LIABLE TO YOU OR ANYONE ELSE FOR ANY DECISION MADE OR ACTION TAKEN BY YOU OR ANYONE ELSE IN RELIANCE UPON THE INFORMATION PROVIDED THROUGH THE SERVICE INCLUDING, WITHOUT LIMITATION, ANY INVESTMENT DECISIONS OR DECISIONS TO ENGAGE THE SERVICES OF ANY PARTICULAR WEALTH MANAGEMENT OR INVESTMENT FUND COMPANIES. WITHOUT LIMITING THE GENERALITY OF THE FOREGOING, PLC SHALL HAVE NO RESPONSIBILITY OR LIABILITY TO YOU IN CONNECTION WITH THIRD PARTY WEBSITES ACCESSIBLE BY LINKS POSTED ON THE SITE (EACH, A "LINKED SITE" AND COLLECTIVELY, THE "LINKED SITES"). ACCESS TO ANY LINKED SITE IS AT YOUR OWN RISK AND PLC IS NOT RESPONSIBLE FOR THE AVAILABILITY, ACCURACY OR RELIABILITY OF THE CONTENTS OF ANY LINKED SITE OR ANY LINK POSTED ON A LINKED SITE. PLC PROVIDES LINKS TO YOU ONLY AS A CONVENIENCE, AND THE INCLUSION OF A LINK DOES NOT IMPLY ENDORSEMENT OF THE LINKED SITE OR ANY PRODUCTS, SERVICES, MATERIALS OR STATEMENTS CONTAINED OR REFERRED TO THEREON BY PLC. PLC attempts to be as accurate as possible with our product descriptions. However, the Company does not warrant that product descriptions or other content of this site is accurate, complete, reliable, current, or error-free. If a product offered is not as described, your sole remedy is to return it in unused condition. Prices and availability of the products and services listed on this Site are subject to change without notice. The listing, description of, or reference to, a product or service on this Site does not imply that the product or service is presently available. All orders of products or services are subject to prevailing applicable law, including, as appropriate, export and import regulations and boycotting restrictions, if any, imposed by governing bodies having jurisdiction over such orders, products or services. In the event a product or service is listed at an incorrect price due to typographical error or error in pricing information received from our suppliers, the Company shall have the right to refuse or cancel any orders placed for products or services listed at the incorrect price whether or not the order has been confirmed and your credit card charged. If your credit card has already been charged for the purchase and your order is cancelled, the Company shall issue a credit to your credit card account in the amount of the incorrect price. The Company is not responsible for the content of any sites that may be linked to or from this Site. These links are provided for your convenience only and you access them at your own risk. Any other website accessed from this Site is independent from the Company, and the Company has no control over the content of that other website. In addition, a link to any other website does not imply that the Company endorses or accepts any responsibility for the content or use of such other website. In no event shall any reference to any third party or third party product or service be construed as an approval or endorsement by the Company of that third party or of any product or service provided by a third party. We may modify, suspend or discontinue any product, service, program or promotion in our sole discretion without prior notice. We reserve the right to reject any order you place with us, and/or to limit quantities on any order, without giving any reason. If we reject your order, we will attempt to notify you using the email address you gave us when you placed the order. Any conduct by you that we determine, in our sole discretion, restricts or inhibits any other user from using or enjoying the Site (or any linked site) will not be permitted. You agree not to access or attempt to access the non-public areas of the Site or any other user's password-protected information or impersonate any person or entity or otherwise falsely state or misrepresent your affiliation with a person or entity. You agree that your data, content, and any information you provided or used on this Site, as well as your use of our Site, products, programs or services do not and will not infringe or facilitate infringement on any copyright, patent, trademark, trade secret, or other proprietary, publicity, or privacy rights (collectively "Rights") of any party, including the rights of third parties; or contain or promote any viruses, trojan horses, worms, time bombs or other computer programming or code that is designed or intended to damage, destroy, intercept, download, interfere, manipulate, or otherwise interrupt or expropriate the Site, data, personal information, software, equipment, servers or content or facilitate or promote hacking or similar conduct. You agree that you will not employ any price-scraping or data capturing tools, code or software, including but not limited to “spiders”, “bots”, scripts or macros to download or otherwise procure any form of content from the Site without consent, and that such actions could be subject to legal proceedings. You accept full responsibility for (i) keeping your account password confidential and secure, (ii) restricting access to your computer or any computer you use to access the Site; and (iii) keeping the e-mail address associated with your account current. You accept full responsibility for all activities that occur within your account. You agree to immediately notify us of any unauthorized use of your password or account or any other breach of security. The Company will not be responsible for any loss or damage arising from your failure to comply with your responsibilities and obligations under these Terms and Conditions. YOU UNDERSTAND AND AGREE THAT EXCEPT AS EXPRESSLY SET FORTH HEREIN OFFICERS, DIRECTORS, EMPLOYEES, AGENTS, SUPPLIERS OR ANY OTHER PARTY INVOLVED IN CREATING, PRODUCING, TRANSMITTING, OR DISTRIBUTING THE SITE OR RELATED PRODUCTS OR SERVICES (COLLECTIVELY THE "COMPANY UMBRELLA") SHALL NOT BE LIABLE FOR ANY DIRECT, INDIRECT, INCIDENTAL, SPECIAL, CONSEQUENTIAL OR EXEMPLARY DAMAGES, INCLUDING BUT NOT LIMITED TO, DAMAGES FOR LOSS OF PROFITS, GOODWILL, USE, DATA OR OTHER INTANGIBLE LOSSES (EVEN IF WE HAVE BEEN ADVISED OF THE POSSIBILITY OF SUCH DAMAGES), RESULTING FROM: (i) YOUR USE OR INABILITY TO USE THE SITE OR OUR PRODUCTS; (ii) THE COST OF PROCUREMENT OF SUBSTITUTE GOODS AND SERVICES RESULTING FROM ANY GOODS, DATA, INFORMATION OR SERVICES PURCHASED OR OBTAINED OR MESSAGES RECEIVED OR TRANSACTIONS ENTERED INTO THROUGH OR FROM THE SERVICE (INCLUDING ANY DAMAGE TO A PROJECTOR OR TELEVISION FROM USE OF OUR PRODUCTS); (iii) UNAUTHORIZED ACCESS TO OR ALTERATION OF YOUR TRANSMISSIONS OR DATA; (iv) STATEMENTS OR CONDUCT OF ANY THIRD PARTY ON THE SITE; (v) OR ACTS OF NATURE, FORCES, OR CAUSES BEYOND OUR REASONABLE CONTROL, INCLUDING, WITHOUT LIMITATION, INTERNET FAILURES, COMPUTER EQUIPMENT FAILURES, TELECOMMUNICATION EQUIPMENT OR OTHER EQUIPMENT FAILURES, ELECTRICAL POWER FAILURES, STRIKES, LABOR DISPUTES, RIOTS, INSURRECTIONS, CIVIL DISTURBANCES, SHORTAGES OF LABOR OR MATERIALS, FIRES, FLOODS, STORMS, EXPLOSIONS, ACTS OF GOD, WAR, GOVERNMENTAL ACTIONS, ORDERS OF DOMESTIC OR FOREIGN COURTS OR TRIBUNALS, NON-PERFORMANCE OF THIRD PARTIES, OR LOSS OF OR FLUCTUATIONS IN HEAT, LIGHT, OR AIR CONDITIONING or (vi) ANY OTHER MATTER RELATING TO THE SITE HOWEVER CAUSED AND ON ANY THEORY OF LIABILITY (INCLUDING NEGLIGENCE). IN NO EVENT SHALL OUR TOTAL LIABILTY TO YOU FOR ALL DAMAGES, LOSSES AND CAUSES OF ACTION WHETHER IN CONTRACT, TORT (INCLUDING BUT NOT LIMITED TO, NEGLIGENCE) OR OTHERWISE EXCEED THE AMOUNT PAID BY YOU, IF ANY, TO THE COMPANY. By using the Site, you agree to indemnify the Company and the Company Umbrella and hold them harmless from any and all claims and expenses, including (without limitation) reasonable attorney's fees, arising from your use of the Site, your use of any of the products, programs, memberships and services you purchase or partake in with regard to the Site, or your submission of ideas and/or related materials to the Company or from any person's use of any ID, membership or password you maintain with any portion of the Site, regardless of whether such use is authorized by you. This Site is owned and operated by PLC. Unless otherwise specified, all materials appearing on this Site, including the text, site design, logos, graphics, icons, and images, as well as the selection, assembly and arrangement thereof, are the sole property of PLC, Copyright © 2010, ALL RIGHTS RESERVED. All audio and video clips are the sole property of PLC or their respective content providers. All software used on the Site is the sole property of PLC or those supplying the software. You may use the content of this Site only for the purpose of shopping on this Site or placing an order on this Site and for no other purpose. No materials from this Site may be copied, reproduced, modified, republished, uploaded, posted, transmitted, or distributed in any form or by any means without PLC’s prior written permission. All rights not expressly granted herein are reserved. Any unauthorized use of the materials appearing on this Site may violate copyright, trademark and other applicable laws and could result in criminal or civil penalties. All trademarks or service marks that appear on the Site other than those belonging to PLC are the property of their respective owners, who may or may not be affiliated with, connected to, or sponsored by PLC. The use of any PLC trademark or service mark without PLC’s express written consent is strictly prohibited. You understand and agree that PLC's principal place of business is in Canada. PLC does not own or operate any facilities outside of Canada. References to any PLC product or service does not constitute an offer to sell or supply that product or service, nor does it mean that the product or service is available in all jurisdictions. Those who choose to access this Site from locations outside Canada do so on their own initiative and are responsible for compliance with all applicable laws and local laws. This Agreement and your use of the Site shall be governed and construed in accordance with the laws of the province of Ontario and the federal laws of Canada applicable therein, excluding the application of any rule or principal of conflict of law that might otherwise refer construction, interpretation, or the resolution of any dispute to the laws of another jurisdiction. Any dispute arising under this Agreement shall be resolved exclusively by courts located in the province of Ontario. You agree not to bring any legal action against PLC in any jurisdiction except the province of Ontario and you shall submit and consent to such jurisdiction. If any provision of this Agreement shall be deemed unlawful by a court of law, then the impugned provision shall be deemed severed and shall not affect the validity and enforceability of any remaining provisions. This Agreement constitutes the entire agreement between you and the Company in connection with your use of the Service. Your use of the Service is not intended and shall not be deemed to create any agency, joint venture or other legal relationship of any kind between you and PLC other than that of independent contractors. It is the express will of the parties that this agreement and all related documents have been drawn up in English. C'est la volonté expresse des parties que la présente convention ainsi que les documents qui s'y rattachent soient rédigés en anglais. If any provision of these Terms and Conditions is held to be invalid or unenforceable, the provision shall be removed (or interpreted, if possible, in a manner as to be enforceable), and the remaining provisions shall be enforced. Headings are for reference purposes only and in no way define, limit, construe or describe the scope or extent of such section. Our failure to act with respect to a breach by you or others does not waive our right to act with respect to subsequent or similar breaches. These Terms and Conditions set forth the entire understanding and agreement between us with respect to the subject matter contained herein and supersede any other agreement, proposals and communications, written or oral, between Company's representatives and you with respect to the subject matter hereof, including any terms and conditions on any of customer's documents or purchase orders. ANY ADDITIONAL, DIFFERENT OR CONFLICTING TERMS AND CONDITIONS ON ANY SUCH DOCUMENT ISSUED BY THE CUSTOMER AT ANY TIME ARE HEREBY OBJECTED TO BY PLC, AND ANY SUCH DOCUMENT SHALL BE WHOLLY INAPPLICABLE TO ANY SALE MADE HEREUNDER AND SHALL NOT BE BINDING IN ANY WAY ON THE COMPANY. You agree that no joint venture, partnership, employment, or agency relationship exists between you and the Company as a result of these Terms and Conditions or your use of the Site. Our performance of these Terms and Conditions is subject to existing laws and legal process, and nothing contained herein is in derogation of our right to comply with governmental, court and law enforcement requests or requirements relating to your use of the Site or information provided to or gathered by us with respect to such use. You may not assign its rights or obligations hereunder without the express prior written consent of Company. This agreement shall be binding upon the heirs, successors and assigns of the parties hereto. Thank you for reading the Terms and Conditions of this Site. We encourage you to review them regularly.